These kits are perfect for those who have always wanted to try double edge razor/ traditional wet shaving but were not certain of where to start. We understand it can be overwhelming seeing so many varieties of shaving supplies out there. That is why we have gathered the perfect shave kit made for those who may be new or returning to safety razor shaving. Wet shaving is the answer to so many struggling with the high cost of cartridge razors, or the cheap painful shaves from shave clubs. Boar hair whips up a lather quickly and easily. Stiff bristles are great for exfoliation. Aesthetics it's a nice razor. Usability on the other hand, not so much. Seems to clog up quickly because of it's razor edges don't have no room underneath. So you get all this buildup. Doesn't cut as well as I thought it would. Still need to make multiple passes just as I would with my cartridge razor (razor burn). I think due to it's design makes it difficult to use. I love the proraso products. Definitely will be ordering more. I'm open to any ideas or suggestions. 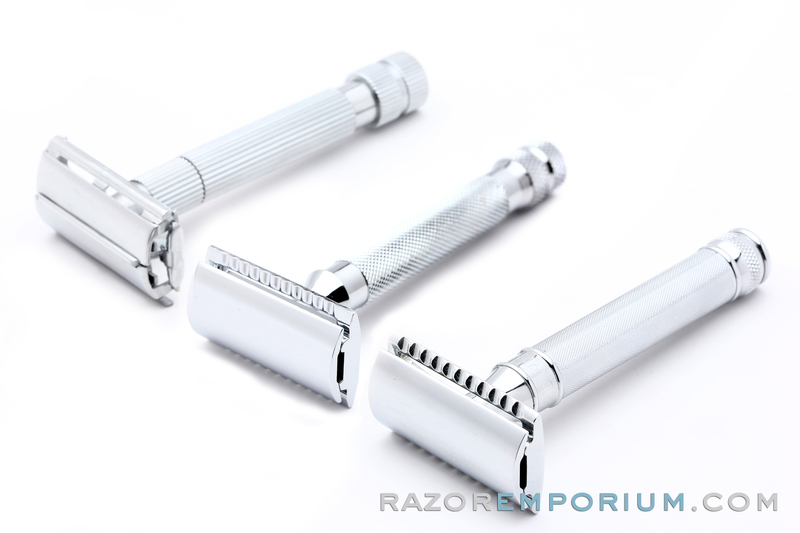 If there is a de razor with a different design that's more efficient, please let me know. Thanks. Very happy with the set. Its my first time with the double edge safety razor and this kit has what you need to get started. The only thing I've added is some pre shave balm. This is my first DE razor I've owned and while I have only one shave in so far, I can say i had a great 2 pass experience with this kit. I added on a Proraso green pre shave and while i have no complaints I kinda wish I bought the White for sensitive skin. The razor was a little heavier than i thought it would be but felt great to use. I used a polsilver blade. Only had a few nicks on the bottom of my neck where my hair starts to grow up, so my fault. The omega brush feels great and the Arko cream lathered up well and didn't stink, which is good. I couldn't be happier with this kit, especially for the price. Lastly, i must say that i'd be lost if it wasn't for Matt's videos on the Razor Emporium Youtube channel. Matt's videos is what made me want to lean toward DE rather than straight razor shaving although i might try that in the future. I purchased The Essentials bundle so I could get into DE Safety Razor shaving. The bundle is high quality and does its job very well. I have been very happy with my purchase and am having quite a bit if fun learning the art of DE shaving. I really like everything except the bowl. I'm not looking for an olive garden salad bowl but was hoping for something slightly larger. It was the only disappointment in the kit. I wasn't planning on buying more hardware so soon. I bought the 'Most recommended' kit, although I'd recommend the 'give it a try' kit over this. Don't get me wrong, I am very happy with the soap, brush, and handle. Although, I may end up buying a more aggressive handle, this one is suitable to start. My gripe is that $110 gets you nearly a year's worth of soap but only 21 blades (20 in the package plus one feather with the handle) Furthermore the beginner blade assortment included with the kit isn't the same one that's available separately in the store! Come on guys! This kit is a pretty good value and for sure gives you the chance to try wet shaving. The razor, which I think is a Weishei, isn’t a bad razor to start with, and the sample pack of blades are a very wide variety. The bowl is thin and small but hey, it’s a bare bones starter set. One cannnot be too picky at this price point. The “software” (cream, pre shave, etc) is of good quality and brand. Proraso is great stuff and it’s used around the world and has been for a very long time. BUT I got 1.5 shaves out of the cream in this set. For me personally, I think that the products need to be a tad larger to get a real “do I want to do this” test run. To clarify, Matt and the Guys and Gals at Razor Emporium can not control what Proraso sells and they can’t be expected to take a loss with hopes of return business. That’s just crazy. What I would suggest is to step up to the next kit; it’s an overall better “bang for the buck” purchase and you’ll get some nice upgrades over this kit. In summary, Razor Emporium is an amazing company and they take pride in Traditional Wet Shaving and the history behind it. If you have questions about ANYTHING, they’re just an email away and seem very happy to help. I personally hope to do much more business with them in the future and this kit started what I consider to be an awesome relationship with a small American business. After watching a number of Matt's videos, I decided to take the DE plunge after having been a near 30 year electric shaver. I ordered the Most Recommended kit and couldn't be happier. I've purchased a few other razors and soaps since getting the starter kit, but my go-to razor is still the DE89, paired up with Proraso Green. 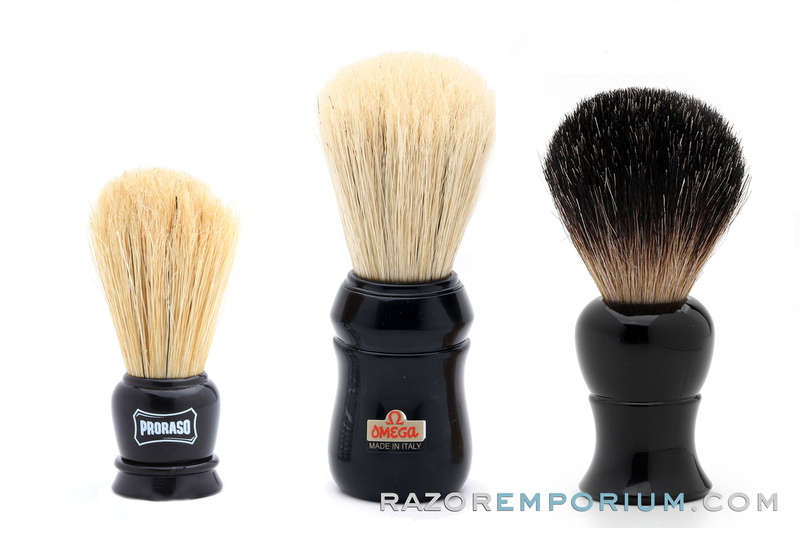 If you're looking at getting started in DE shaving, I highly recommend getting your starter kit from Razor Emporium. I bought the "Most Recommended" package. Tonight was my first safety razor shave and I am very pleased. 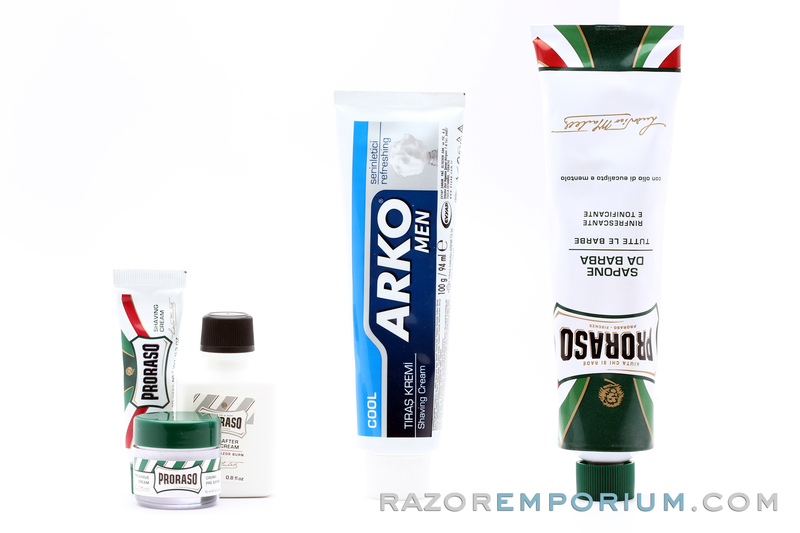 I bought the Proraso green pre-shave cream and post-shave balm to go with the green shaving cream. I used the Astra Blue blade on the Edwin Jagger DE89 and it was a great experience. This kit comes with everything you need to get started. Just buy this kit and watch a couple Youtube tutorials and you are ready to go! I would gladly recommend this kit!